Visit MIE's OZ Library for evolving resources on the Opportunity Zone program. If you have a project to share, please fill out this poll to share more information. With guidance from the IRS and CDFI Fund, states that have chosen to participate have now designated Qualified Opportunity Zones. Some states requested input for their selection processes from local governments and other stakeholders. For example, Washington State developed a procedure for nominating tracts; and Missouri collected formal feedback from local governments. As of June 2018, all state selections of OZs were certified. From there, the work of O Fund development has begun. A total of 42,176 census tracts were eligible to be designated as Opportunity Zones. Of these, a total of 8,762 were designated, and of these, 8,532 were low-income communities, while 230 were in contiguous communities. According to Census data and Economic Innovation Group analysis, in the average Opportunity Zone, the median household income is $33,345, the poverty rate is 31.75%, and the unemployment rate is 13.41%. A total of 31.3 million people across the 50 United States live in areas that have been designated as Opportunity Zones. 56% of residents are people of color. Over 75% of Zones are in metropolitan areas. 294 Opportunity Zones contain Native American lands. Read this assessment of the selected Opportunity Zones by Urban Institute. 1) Would states select the maximum allowable amount of contiguous tracts, as more likely opportunities for investment? Ultimately, contiguous tracts represented 2.6% of all designated tracts, lower than the 5% acceptable under the regulation. 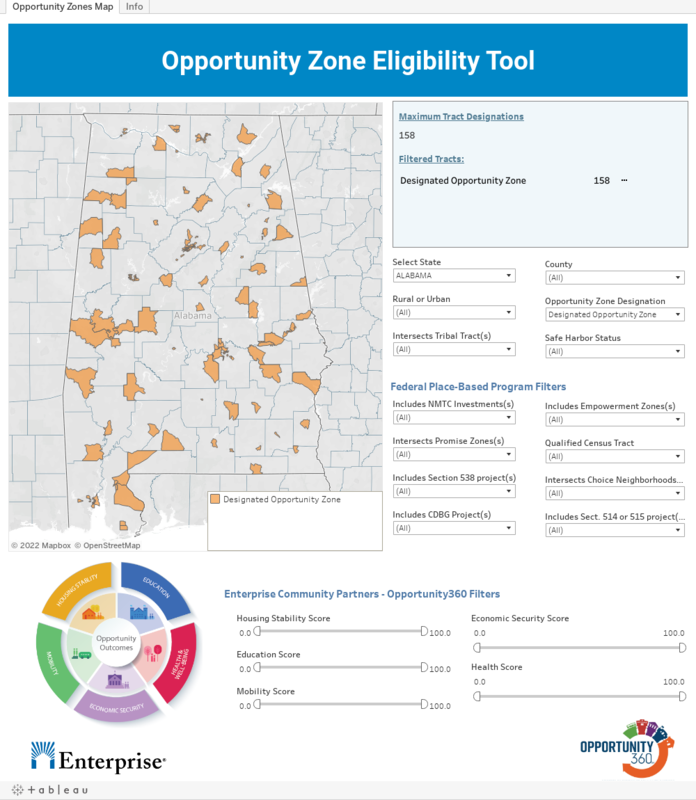 Below is a map of Opportunity Zones Program from all participating states, via Enterprise Community Partners. Enterprise's tool provides a variety of filters to analyze tracts according to community development indicators.